When people hand you a Moo MiniCard, they don't surreptitiously slip the business card into your hand; they splay out their set of cards and let you choose your favorite one. Then they tell you about the image on the back, whether it's a photo from a vacation, a product shot, an avatar or an innovative digital design. And though the pint-size cards may not fit neatly in your Rolodex--they're only half the size of traditional business cards--their colorful appearance and slick, high-quality feel make you take notice. 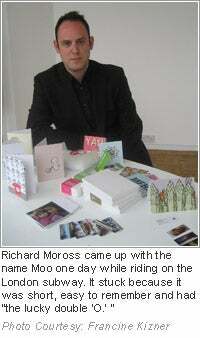 Richard Moross, 30, came up with the idea for MiniCards late one night in 2003. As the strategic planner for a design firm, he was losing sleep thinking of a product idea. He thought about Coca-Cola's mission to have everyone in the world in arm's reach of a Coke and started running through the everyday items he had around. Moross looked close--to his pockets--and hit on business cards, realizing that when it came to people promoting their personal websites and blogs, they were still often scribbling their URLs on napkins or whatever else was at hand. Moreover, people were developing other aspects of their online identities, like MySpace pages and Flickr accounts, that didn't yet have a place in the physical world, and a traditional business card just seemed too stuffy to do the job. With MiniCards, Moross cuts away the blank space that makes up much of a business card and incorporates a personal image on the back. But when his design firm didn't have the means to develop the idea, Moross branched out and started Moo. The cards quickly became popular with the Web 2.0 crowd that uses them as a supplement to traditional business cards. And since launch, there has been international demand, which Moross hadn't predicted. When the first batch of foreign-language cards was printed, they came out with question marks in place of text and Moross had to add support for multiple languages. The London-based company now translates its site into German, Italian, French and Spanish. "Within a month, we had more holiday cards than Hallmark," Moross says. The company continues to reach out to its community through a candid blog, parties, product development sessions and an "Overheard at Moo" Twitter stream, which all foster the company's fun, approachable and transparent culture. Moross also makes sure to listen. He has his entire team copied on customer service requests so they know of any problems, and he makes sure to monitor any mention of his company online. And mention it, they do. By encouraging customer communication and having a "blank canvas" product that inspires creativity, Moo benefits from organic word-of-mouth marketing. Its message is only helped along by the nature of the Moo product. "Everything we manufacture is handed from one person to another," Moross says. And by making his product's style stand out with distinctive shapes, heavy paper stock and a lustrous finish, even the most custom orders are recognizably Moo. Then there are the company's partnerships with social networking sites. Though Moo initially partnered only with Flickr, the company is now paired with Bebo, Facebook, Fotolog, LiveJournal and Vox, which collectively reach more than 100 million users. Moo has also opened up its API, so any other company that would like to design an integration can. It has already seen programs that generate 3D barcodes for stickers, create a MiniCard mosaic from a large image and import Flickr photos sorted by color. Though Moross declined to share sales figures, he did say that in 2007 Moo shipped 10 million MiniCards--which are sold in $20 packs of 100--to 180 different countries. The company has also tripled its work force from 11 to 30 since 2006. Now he's focusing on expanding his young company. "We had a really successful idea that was a single product," Moross says. "And we have to scale that out to multiple products."